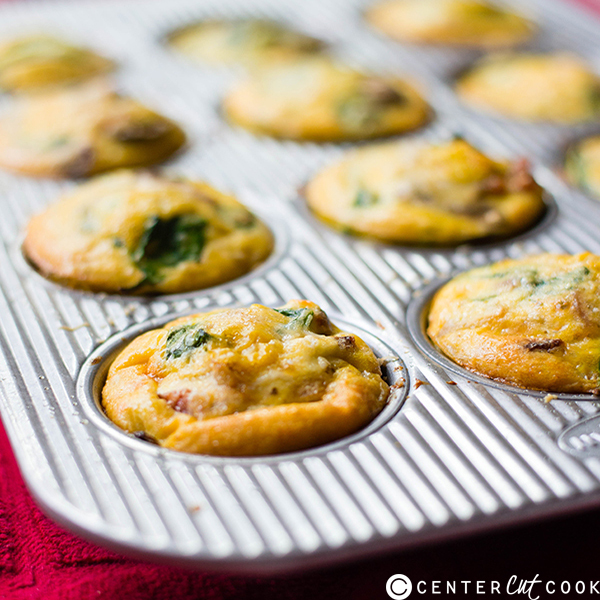 These Mushroom, Spinach & Bacon Egg Muffins are a great, filling, and a healthy grab and go breakfast idea for kids and grown-ups on those busy mornings! Weekday mornings are super busy in our house. It seems, by the time I am even able to fully open my eyes and think semi-coherently, it’s already time to rush out the door to get the kiddos to school. What my kids used to do (a lot) was eat cereal for breakfast. Sugary, empty calorie, highly processed cereal. Sure, maybe sometimes they’d have toast or reheated oatmeal. But, mostly sugary cereals. Oh, and sometimes pop tarts. Sigh. This meant I was essentially giving my kiddos way too high of sugar levels which would spike their energy level at first, but then likely leave them to totally crash once they were at school. Nice. Way to go, mom. So, I started creating new, healthier ways for them to get their breakfast. Sure, I could make them a protein shake to go along with the one I made for myself, but they got bored of them very quickly, especially on cold mornings. So, I got to thinking…what if I could make something savory, something with eggs, something that is handheld, and something that is nice and hot for them to eat in the morning. But – wait – this would also need to be nutritious, full of protein and vitamins, and keep them full until lunchtime. Oh, and this would have to take like zero time to put together because we have no time in the morning to cook anything. Enter the egg muffin. 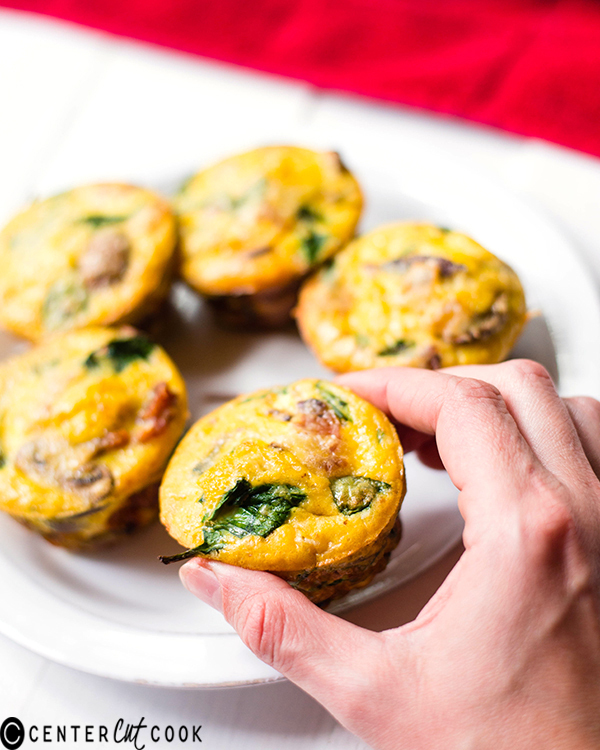 These little Mushroom, Spinach & Bacon Egg Muffins are the perfect solution! They’re fresh, easy, hot, and delicious. Plus, they’re jam-packed full of protein and other goodness to keep them full and energized for a good while without any sugar crashes. And they’re super cute little tasty treats that are handheld. Winner Winner! What’s even better is they can be prepped ahead of time, say on a weekend when I actually have time, and can just be reheated during the week. I usually wrap mine in a paper towel and reheat for about 30 seconds to a minute. Quick, easy, tasty, and healthy….plus handheld perfection! Everyone wins. Grease a 12-count muffin tin with olive oil. Heat olive oil over medium-high heat and add the diced onion. Cook, stirring frequently, until begun to sweat, about 3-4 minutes. Then, add the mushrooms and cook 4-5 more minutes, until onion is tender and mushrooms are well-browned and tender. Turn off heat and add spinach, stirring constantly, until the spinach is wilted. Allow to cool. In a large bowl, beat the eggs until smooth. Add the goal cheese, cooled spinach mixture, crumbled bacon, milk, and mix together. Ladle the egg mixture into the greased muffin cups – you can fill them almost all the way up. Bake for 25 minutes, until golden brown on top.